NovaBond Multi Surface Primer has been specifically designed for single process cleaning to promote adhesion of NovaBond HS bonding tapes. It dramatically enhances bond strength with the NovaBond SignFix range of high strength bonding tapes although it is compatible with most technologically advanced acrylic adhesives. Chemically alters the substrate surface to increase surface energy making it more receptive to adhesive bonding and resulting in much higher bond strength and temperature resistance. Care should be taken when opening these containers to release the pressure slowly. 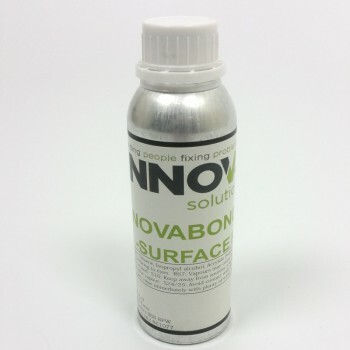 Remove any heavy contaminants such as dirt and excessive greases or oils with NovaBond Surface Cleaner following the instructions. Apply a thin uniform coating of NovaBond Surface Primer using a clean, dry, lint-free cloth. Product should flash-off in around 10 seconds but dry any over-wet areas and we recommend leaving the surfaces for 5 minutes prior to bonding to allow the primer to act on the surface. Porous surfaces may require a second application to ensure uniform coverage and good adhesion. Allow first application of primer to dry before applying the second coat. Occasional skin contact with NovaBond Multi Surface Primer should have no adverse effect. Prolonged soaking or repeated contact is not recommended.